You might have noticed that things have been a bit quiet around here these past few weeks. My reading is going well enough, but I’ve been facing a major reviewing slump: no two words I put together seem to make any sense. So while I wait for it to pass, here’s your gratuitous cat picture of the day. I’ll be spending my Sunday finishing The Forgotten Beasts of Eld (which I’m reading with Aarti), hopefully with a purring feline by my side. And maybe I’ll sneak in a couple of episodes of Buffy. Operation Watch Buffy At Long Last is going pretty well so far, by the way, even if part of me wants to write a 500 words rant about the show portraying the librarian as a complete Luddite (I do love Giles overall, though). Also, I hope everyone heading to New York for BEA next week has a wonderful time. I feel much the same way about BEA as Amy does – I’m not personally very interested in the industry connections side of it, but I really really wish I’d have the chance to spent time with blogging friends. Those of you going will have to tell us all about it when you get back. Have a great Sunday, everyone. Does anyone have any exciting plans? I'm the same as you in relation to BEA but I am hoping to get at least a little bit of a similar experience next weekend at Aussiecon. Other than that, I have overcommitted to too many things and feeling the pressure! Yup, I feel the same about BEA too. Not interested much in ARCs or publisher relationships, much more interested in other bloggers that I still only know virtually. I feel the same about BEA. I hope you get over your reviewing slump soon! I've been to SIBA, which is a smaller conference focused on Southern writers and bookstores. But that one is pretty small and intimate. I have heard BEA is large with lots of lines. Blech. But meeting other bloggers is the attraction. I'm hoping I can go someday just to meet the people. Have a wonderful day reading with kitty. I understand the review slump. I have more days than not when I cannot put a sentence together. I would love to have a blogging meet-up that does not involve publishers :-) Like the blogger unconference, which sounds interesting. 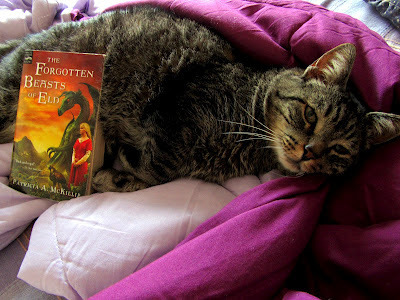 So glad you are reading Forgotten Beasts of Eld - I hope you enjoy it, and look forward to our chat! I love The Forgotten Beasts of Eld - it's the only McKillip that I DO love. Hope you are loving it too! Know how you feel about reviewing at the moment :D Hope it lets up soon though, your reviews always make a ton of sense! I am SO glad you are finally watching Buffy!! I can't wait until you get to the part in the second season where it starts getting really good -- then the magic begins. Also, gratuitous cat photos are always welcome. Cat photos are never gratuitous! I love this photo! Are you watching all the Buffy episodes? I haven't ever seen one. Hope you had a nice day reading with your cat and got in some Buffy episodes. My cats were happy to have me sit down and read for a while too. Cat! What a sweetie. I agree on the BEA bit. I have loved meeting up one-on-one with a few bloggers over the past year or so, but there aren't that many opportunities to do that if you live off the beaten path. Forgotten Beasts of Eld is an amazing book. I hope you enjoy it! McKillip's writing has that perfect sense of fairy tale magic, and I've enjoyed everything that I've read by her thus far. Kitty Fan here; your's is a cutie! Sorry to hear you have been in a slump but I do love the gratuitous kitty picture!